*A future tweak to this meal for me might be to omit the walnut and top the pasta with pecan crusted catfish or chicken. But that’s for another day. Make the tortellini according to the package instructions. 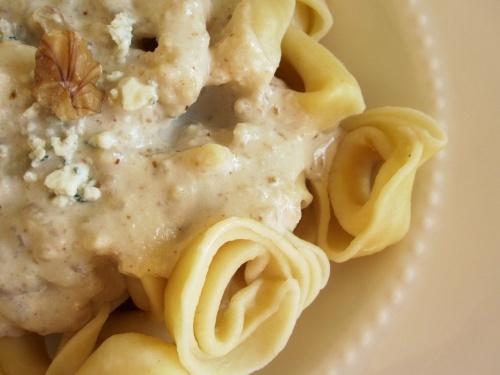 In a food processor, pulse the gorgonzola, pear, and walnuts until smooth without any large chunks of nuts left. With enough processing it will begin to look like a sauce on its own. In a saucepan, melt the butter over medium high heat. Stir in the flour, heavy cream, and wine. Add the gorgonzola mixture to the pan and stir until evenly mixed. Allow to come to a boil, stirring frequently. Once at a boil, reduce to low and cover. Allow to simmer 7-8 minutes, or until creamy and thickened. Add salt and pepper to taste. The sauce will have a lumpy but even texture due to the nuts. Sauce will thicken further as it cools. Serve hot over tortellini.